If you ever have a chance to go to a Grand Opening of ANYTHING in the Big Bend, DO IT!!! 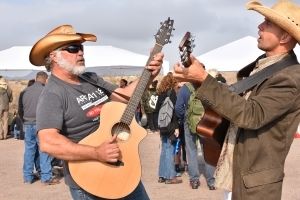 Folks in Far West Texas are always looking for a good reason to throw a big party, and when it comes to grand openings, there are usually lots of reasons to celebrate. 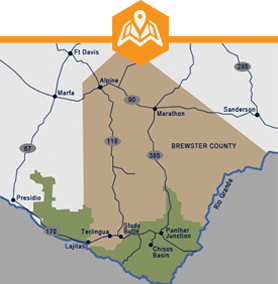 Take for instance, Big Bend National Park’s brand new destination-worthy exhibit, the Fossil Discovery Exhibit. This incredible display of art, science and history just had its Grand Opening January 14, and lots of people came out for it. Ross Maxwell, the park’s first superintendent, was a geologist, and always saw the potential of the park to be a geological wonderland. 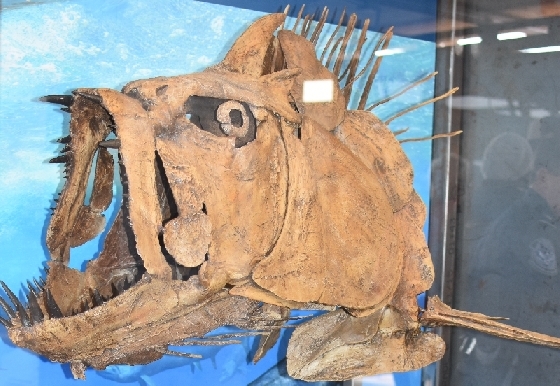 This exhibit finally showcases that potential, by displaying replicas of fossils from the park’s 130 million year-long fossil record. There are sea creatures from when the park was covered by a sea, there is a full-sized Crocodilia skull from when the park was a swampy coastline environment, and there is the first-ever replica of a flying pterasuar, a species of Quetzalcoaltlus found in the park. Don Corrick, the park geologist, said that replicas of that Quetzalcoaltlus can be found in museums all over the world, but until this exhibit opened, there had never been one to view at Big Bend, where it was actually discovered! 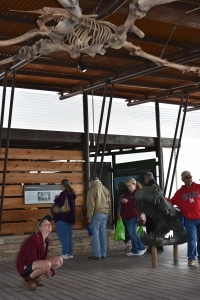 The Fossil Discovery Exhibit is just 57 miles due south of Marathon, Texas, on US-385. 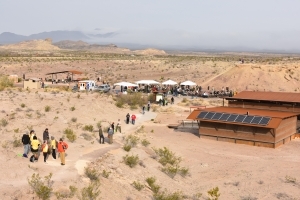 Besides all the cool displays, the exhibit area has trails to some great look-out points, and there is a covered picnic area, and vault toilets. These are all majorly appreciated conveniences when you are traveling out here in the middle of nowhere with no other options! 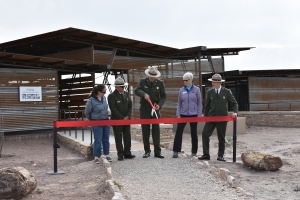 If you missed the grand opening, no worries, the exhibit is open to the public during park hours, and it’s self-guiding, so you can visit anytime at your own pace. You will walk away with a new appreciation of what mysteries lie beneath the vast landscapes of this park. View of the exhibit center from one of the trail lookout points. 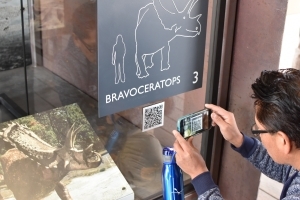 Displays are equipped with QR codes to download more info. Don’t forget to look up! A life-size replica of the Quetzalcoaltlus that was found in the park, graces the ceiling of the exhibit. Musicians set the tone for the after party of the Grand Opening.